I took a last-minute weekend trip to my small hometown in Minnesota last weekend. I wore this skirt on Saturday out for drinks catching up with a couple old friends. I wore this skirt to church on Easter Sunday. 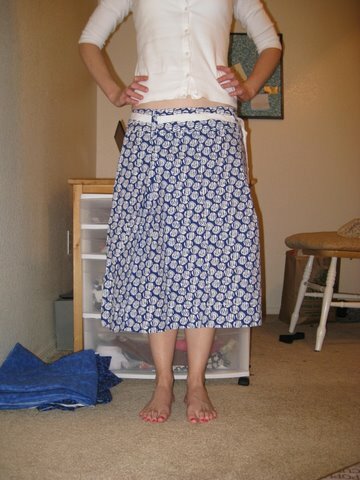 I wore this skirt to work on Tuesday. And then — and then! — I washed it. I can’t remember the last time I sat in a pew next to my mother during a church service. She passed me the little book where people sign in if they want to note their presence. “Hm, I think I’ll mark out-of-town guest, or maybe returning visitor…” I mused. “Or you could check the member box, you are technically a member,” she said. “Um, actually, I was just mouthing the words during the confirmation ceremony in 9th grade, I didn’t actually say them…” I replied. April 29, 2011. Tags: before & after, clothes, completed project, refashion, Target, What I Wore to Work Today. Pictures, Projects, What I Wore to Work Today, Words.